You may know Jacobs through their large-scale facility operations, test and evaluation (T&E) capabilities; their many federal and commercial engineering, procurement, and construction (EPC) projects; or maybe through their environmental remediation work. However, the Jacobs that you know appears to be changing. In August 2017, Jacobs acquired CH2M Hill for $3.3 billion to improve their design, engineering and program management services in key infrastructure and government service sectors including transportation, environmental, and nuclear. Also in August 2017, Jacobs acquired Blue Canopy, a data analytics, cybersecurity, and application development firm, as part of ongoing investments to expand their digital solutions. Blue Canopy compounded the Van Dyke Technology Group acquisition in cybersecurity solutions support and expanded Jacobs’ client base into the federal civilian financial and healthcare sectors, where they have been lauded for their data analytics and security operations center solutions. In October 2018, Jacobs sold their Energy, Chemicals, and Resources (ECR) business segment to Australia-based WorleyParsons for $3.3 billion (expected to close by July 2019. The result of the ECR sale has led to Jacobs to narrow their focus on two business segments – Aerospace, Technology, Environmental, and Nuclear (ATEN) and Buildings, Infrastructure, and Advanced Facilities (BIAF). Jacobs’ recently released 2018 annual report reflects a 50% increase in their 2018 revenue ($15B) from their 2017 revenue ($10B). This does not reflect the divestiture of their ECR business segment. This filing also details several of Jacobs’ internal tools, which they use to monitor and improve their performance. These tools include the Jacobs System to Ensure Project Success (JSTEPS) and Safe Plans of Actions (SPA) to add value and foster continuous improvement; JacobsValue+ (“Value Plus”) to quantify actual value or savings that Jacobs provides for clients; and BeyondZero, Jacobs’ global program that extends the company’s focus on employees’ health and welfare beyond an injury-free workplace. 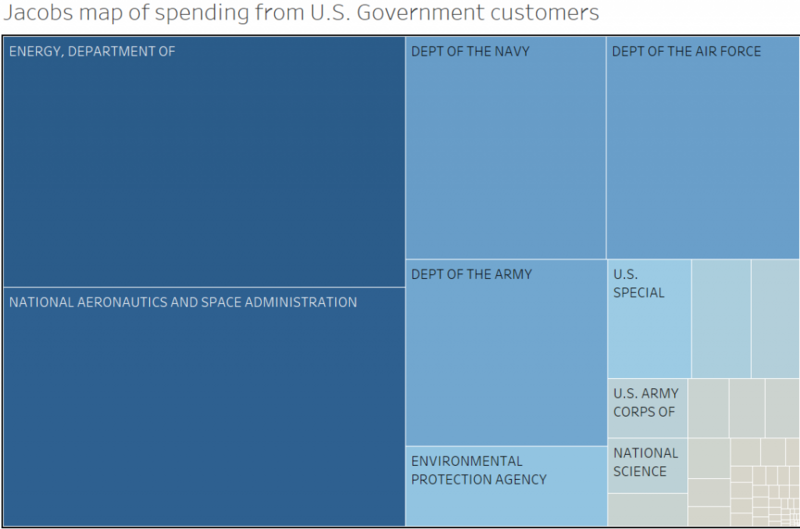 In the federal contracting space, Jacobs’ largest customers are the U.S. Department of Energy (DOE), National Aeronautics and Space Administration (NASA), and across all of the U.S. Department of Defense. The sale of ECR does not affect significant work with DOE. That work remains. Figure 1 – Spending over the period of FY2013 to FY2017 by U.S. Government customers. In the past year, Jacobs has recorded a number of major contract wins, both as a prime and subcontractor. In June 2018, Akima Support Operations was awarded a five-year, $132 million 8(a) set-aside contract for NASA’s Facilities Operations and Maintenance Services (FOMS III) at Goddard Space Flight Center (GSFC). Jacobs serving as a strategic subcontractor to Akima which may provide them insider access to win the prime work that they have been seeking (unsuccessfully, so far) at GSFC. In June 2018, Jacobs was awarded a seat on the ten-year, $978 million Defense Threat Reduction Agency’s (DTRA) Cooperative Threat Reduction Integrating Contract (CTRIC III). CH2M Hill was an incumbent on DTRA’s Biological Threat Reduction Integration Contract (BTRIC) which has been moved into CTRIC III. In December 2017, Jacobs was re-awarded the eight-year, $1.2 billion Engineering Services and Science Capability Augmentation (ESSCA) through NASA’s Marshall Space Flight Center (MSFC). In September 2017, the DOE’s National Nuclear Security Administration (NNSA) awarded the 10-year, $5 billion Management and Operations (M&O) contract to Mission Support and Test Services LLC (MSTS), a joint venture led by Honeywell International and supported by Jacobs and Huntington Ingalls Industries (HII) Nuclear. As Jacobs refines their portfolio, we can expect them to increase their aggressiveness and focus as an already-formidable competitor. While they are certain to continue their work in the test and evaluation, management, and scientific spaces, we should not be surprised to see them pursue more software development and cybersecurity work as well as increasing their attention to engineering, procurement, and construction contracts, both in the federal and commercial markets. Jacobs will be a high-threat competitor in almost any competition they decide to enter, so be sure not to discount their capabilities or fall into any common black hat traps when evaluating your captures. As always, stay focused on your opportunities. Do your capture (and CI) homework. There are some great opportunities out there. Happy hunting!